The higher-than-average percentage of women in this field shows that high power technology is not necessarily only attractive to men. Following the signature in April 2011 of the Procurement Arrangement for ITER's AC/DC converters and the reactive power compensator and harmonic filters, the Chinese Domestic Agency awarded contracts to two domestic suppliers for these systems. 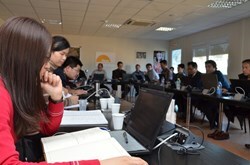 The first face-to-face meeting between responsible engineers from the ITER Organization, their counterparts from the Chinese Domestic Agency and suppliers ASIPP (for the AC/DC converters) and Rongxin Power Electronic (for the reactive power compensator and harmonic filters) was recently held at ITER Headquarters. 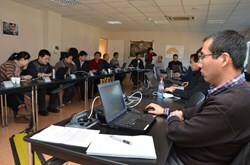 The challenge at this stage is to jointly develop the detailed design for ITER's power supply components. The Procurement Arrangement is based on functional specifications describing the technical requirements of the system; the challenge now is to jointly develop the detailed design. "The meeting was very successful and efficient," said Ashok Mankani, Power Converter Project Engineer. "It should be considered a good start on the road to developing a better understanding of the scope of this Procurement Arrangement, the interfaces and the next milestones that have to be achieved." The AC/DC converters components are essential for supplying DC power to ITER's poloidal field coil circuits with the operating requirements of 55 kA and 1.35 kV to 4 kV. The large capacity of 3x250 Mvar reactive power at 66 kV is essential for the stability and performance of ITER's power system.